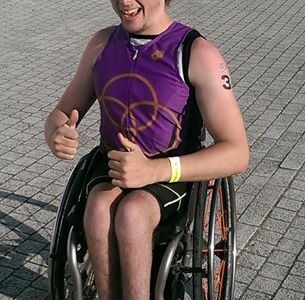 Dan went one better than his bronze at the National Paraduathlon Championships by taking second place at his first paratriathlon of the season. Here is his take on the day. Not got the times yet but I was about 3-5 minutes behind Neil in swim and he was looking for 15 minutes. Found it difficult at the start because I was behind people who could kick, so I was being splashed and kicked in the face. But once they got ahead I was able to get into my own rhythm, breathing every 3 or 5 strokes. Sighting was easy. Transition one felt very quick. Was allowed to get my wetsuit off at the side of the dock and take my wetsuit to transition. Then put it in the box and got straight onto my bike. At the start of the bike I felt a bit sick from the taste of the water (goose poo, yum) but it didn’t affect me too much. First 3 laps I was gaining by 30 seconds and averaging around 28-29kmph. Roller work is definitely translating more onto the road now. Last 2 laps were a bit slower but tried to put a big effort coming into transition. I knew Neil and marks transitions would be slower. I was about a minute down from Neil and 1 and a half from mark. T2 was very good, pushed myself out my bike, slight cramp in my legs but I was able to use my arms to get me up. Mum passed helmet and gloves whilst dad strapped me in. Aimed to hammer the chair. I was the fastest out of the three on the chair. Caught Neil on the first hill as he was struggling to get going, I was about to catch mark on the second lap but he was slightly to far ahead. If it was 10k I would have got him. Dead turns were really good on the chair, Alasdair said I was good at getting going again and not eliminating too much speed into the corners. Finished as strong as I started the chair. Very sore after, sun burn. Will remember that for next time. Coach Note: Dan swum 21.11; handbiked 49.39 & pushed 16.35 to finish with a total time of 1.28.37. Over two minutes quicker than his time at Liverpool.